Size of baby: A cantaloupe or something like that. I always have measured right on or a little big with this one, so I’m really not sure exactally. Worries: What will labor be like this time? Will it go as smoothly as last time? Will I be able to get an epidural? How will things work if he does come early (which I kind of hope he does)? Will I be able to loose the baby weight without going crazy afterwards? We haven’t had an ultrasound since 20 weeks, so we are just hoping everything is still growing well. 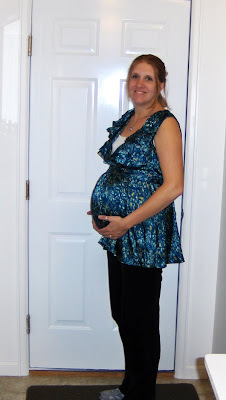 What is different this time around: Jay was breech until 16 days before he was born, so a lot of the movement at the top of my stomach and crazy jabing limbs is not something I remember. At my last appointment the midwife said she thought baby’s head was down and he was sitting “low”. I felt pressure down there almost like I was bruised and she said that was probably because he was sitting low. I don’t know that he has dropped because I am not waddling when I am walking, but I do need to pee every 45-60 min and sometimes it just HITS me. I get comments at least once a week about how much better I look during this pregnancy compared to my last pregnancy. I really think the biggest changes are that: I take a nausea pill every morning, I take B6 along with my other vitamins, and I EAT instead of feeling sick and not eating. We still haven’t decided on a middle name. Hmmm…. Symptoms: By back has been hurting a bit more, but I have started icing it before bed and that seems to help. Last night I had to go to the bathroom 3 times during a 45 min. period. CRAZY. Heartburn is BAD. I had heartburn so bad at 4:30AM this morning that I got up and ate a piece of cheese before I could go to sleep. I don’t know if I got heartburn from swallowing my nausea pill with water at 2:00am or if was from something I ate the night before. NOT FUN. I don’t eat chocolate, tomatoes or tomato sauce, citrus anything, coffee, spicy anything or anything else that I think might give me heartburn. I also get a lot more Braxton hicks contractions (especially when I walk around at school or I am on my feet a lot). Sleep: Usually get up a few times to pee and get up in the middle of the night (for like an hour or more) at least once or twice a week because of heartburn, my back hurting, or just because I can’t sleep. I go to bed at 8:30 or 9:00 most nights which is great. Movement: A lot more movement than I remember last time, especially when I am up and moving around. I can tell space is getting tight in there as the kicks turn into shifts. Jay had the hiccups a lot before he was born, but this baby only gets them occasionally. The belly: getting harder to find shirts long enough to cover…so glad it is almost over. Milestones: Baby is probably big enough to be fine out of the womb…so he can come anytime. Best moments of the week: Baby loves dancing to music. We did a bit more in the nursery, but it is still not close to being done. Listening to Jay and John giggle. The best moments for me are napping on the weekends when Jay nap. At this stage in my pregnancy with Jay I was getting naps every day because it was summertime.